Plaque is removed thoroughly and gently, even in places a conventional toothbrush can’t reach. Plaque removal with a conventional brush often causes damage to teeth and gums which doesn’t happen with SWAK. When brushing your teeth with the SWAK toothbrush the moistened head is moved gently over the necks of your teeth. Thus plaque is gently removed from your teeth. Once a day is more than enough; at the earliest it takes 24 hours before plaque bacteria produce acids which then start to attack the teeth. You only need to clean until each tooth feels smooth; you can check with your tongue if there is still plaque on your teeth. Using the tip of your tongue you can check each individual tooth; plaque feels rough and furry, clean teeth feel smooth! The SWAK toothbrush offers you the chance to brush your teeth whenever and wherever you want, even out of the house as you neither need water nor toothpaste. You’re no longer chained to the sink; the SWAK toothbrush is used flexibly in many situations: whilst watching television, or at the computer, in the car…actually anywhere and everywhere! Teeth cleaning with the SWAK toothbrush is carried out using the “swing technique”. 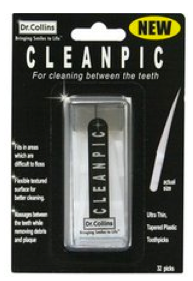 The bristle head is moved gently over each tooth’s surface close to the neck ensuring existing plaque bacteria colonies are removed (disorganised) and therefore rendered harmless: no toothpaste necessary! * To change the taste of the miswak wood, a drop of tooth oil can be dripped onto the SWAK head. 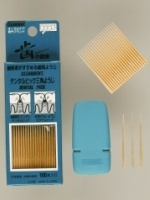 * Hard bristles can be softened by gently nibbling the tip. Bristles that are too long can be moistened and then cut with regular scissors. * Children can use the SWAK toothbrush on their own at the earliest at age 7. 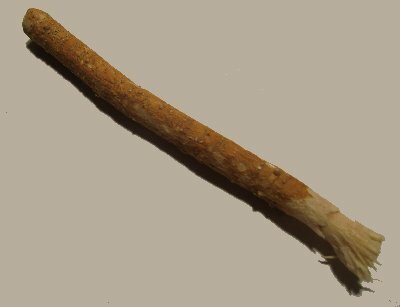 * The SWAK Tooth Salt contains the health-promoting components of the miswak wood and works on healing on inflamed gums. * Like with conventional toothbrushes the SWAK should not be kept in an airtight container. As with conventional nylon toothbrushes the SWAK should not be kept in an airtight container. When used with the “swing technique” the SWAK bristle head is very durable. A replacement of the bristle head only becomes necessary when a decreased cleaning action is noticed when checking your teeth with your tongue. The Lumberjack (David Prince or Charlene Reichert) is camped out in the Gallery. The Lumberjack whittles toothpicks and is happy to engage in conversation. Toothpicks are for sale! They are available directly from The Lumberjack in the gallery or online at http://www.davidprince.org/shoppe/. The most readily available product similar to the much appreciated Interdens are the lesser quality Jordon Woodsticks. I am thinking perhaps Interdens were being made elsewhere by a different company. Or perhaps a product equally as good. So began this hunt. Below are my findings. 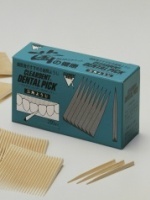 Triangular “Japan Pick” – “DOCTOR Pick” Products or parts description One end of Doctor Pick is triangular, designed according to the space between teeth. Features Because of its shape, formed according to the space between teeth, Doctor Pick does not damage the gum or teeth, while effectively removing detritus from the teeth and massaging the gum. Field of use In addition to general stores and drug stores, Doctor Pick is marketed to hotels and restaurants including fancy Japanese-style restaurants, after being packaged in a paper sleeve with a customer’s name printed on it. ———————————————- Triangular “Comb” – “DENTAL Pick” Products or parts description Our triangular dental picks aren’t just convenient-they’re quite simply the most important tool available for cleaning between the teeth. And they come with a carrying case. Traditional round toothpicks were originally designed for cooking purposes and used for skewering pieces of fruit and other foods. They’re basically for kitchen use, which is why they’re sometimes called “cocktail picks”. Features And it’s a well-known fact that forcing a big round toothpick in between your teeth can and does injure your sensitive gums. But our dental picks are made triangular so they fit easily in the narrow spaces between your teeth. The two upper edges are designed to scrape away the plaque that gets lodged on the surfaces of your teeth, while the base lightly presses and massages the fleshy part of the gums between your teeth. Field of use This massaging action promotes blood flow to the gums, which is very important for the prevention of gum disease. The practice has already gained wide acceptance in Europe and the US. You can carry a packet of our dental picks with you wherever you go and use them to care for your teeth after every meal. Dental picks are for the protection of teeth and gums, so find them sold at most pharmacies as well as in the toothbrush aisle of volume retail stores. “Dental Picks” are the triangular toothpicks developed according to the spaces between teeth. The section of pick is an isosceles triangle ; its two sides will clean the teeth and its base will massage the gums. An occasion uses one three angles of connected toothpicks. The raw materials use the white birch which is raw materials of the xylitol of the sweetener and have you use it in peace. With a case for carrying, it is clean for carrying around at the time of going out and is convenient at all. The item pictured and advertised as a genuine Johnson & Johnson product was not a JNJ product. Amazon should not advertise it as Johnson & Johnson. The original product was superior to the product that is being sent to customers who answer the Johnson & Johnson ad. This product was formerly produced in the US. It now comes from China and it has a rather nasty aftertaste and collapses easily. 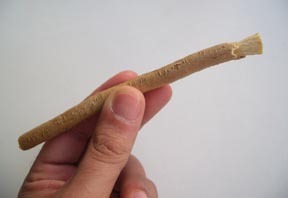 Stimudents are simply a very thin wooden toothpick made of orangewood (from an orange tree – a softwood). 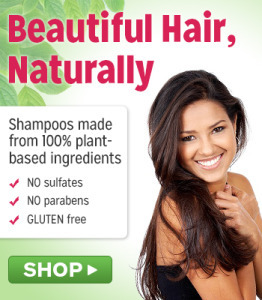 You can buy them in many drug stores (especially CVS and Walgreens) or super markets. They work just as well as floss to clean between your teeth. (They can be hard to find, but you can call Johnson & Johnson at 800-526-3967. Wait until the automatic answering system gives you a choice to go to the oral health section. 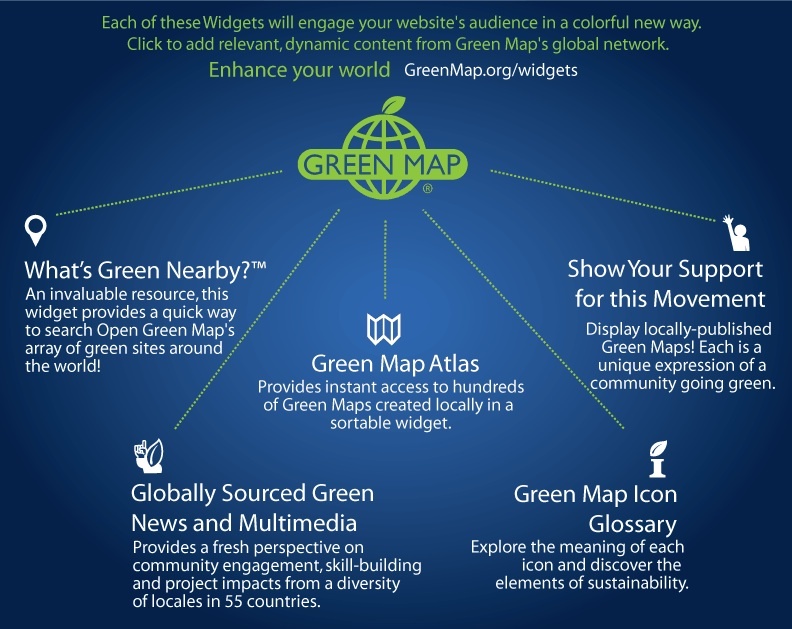 Once there you can speak to a representative who can tell you all the stores in your area where they are sold.) 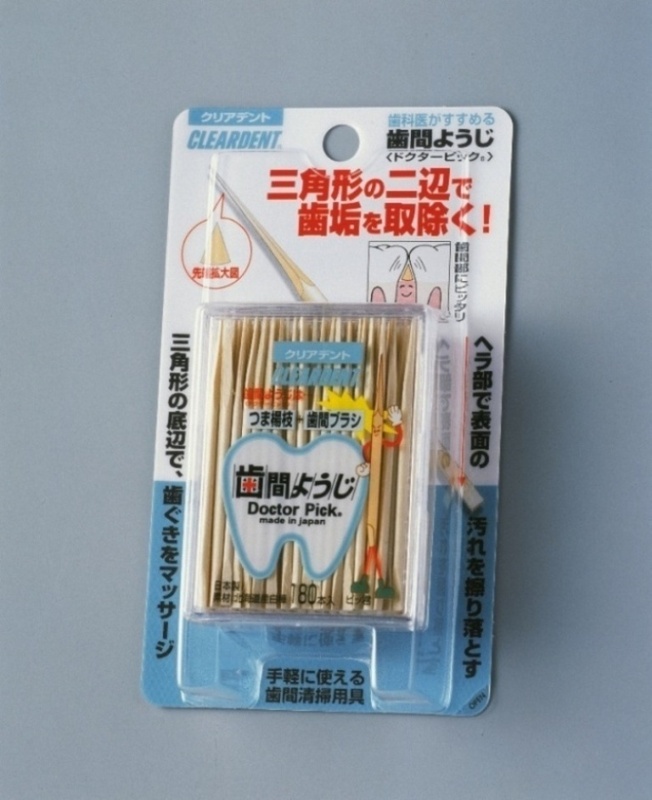 Simply break one off , wet the end by sucking on it, and begin cleaning between each of your teeth just as you would use a toothpick at a restaurant. Notice that the Stimudents have a wedge shaped cross section. The flat edge is placed closest to the gums while the point is pointing toward the edges of the teeth . The Stimudents are pushed as far between the teeth as they will go. You can reach the furthest spaces back in your mouth as I am doing here. At first, you will experience some bleeding and some discomfort because the plaque bacteria have caused a chronic infection in the gums, and like any infected tissue, it hurts when it is touched. However the pain and bleeding subsides within a week or two after you start using them. These little sticks are worth their weight in gold, because they have worked so well to cure so many of my more motivated patients’ chronic periodontal disease. Since they are disposable, the patient does not have to be near running water to use them. They frequently use them while commuting to work or watching television. It feels great to use them, especially after the disease clears up, and once patients notice that the bleeding has stopped and their teeth are no longer mobile, they feel good about themselves. Stimudent this is a fairly decent attempt by Natural Dentist to give the people what tey want, including putting out a thick version and a thin Version, to get chinese to package it as Stimudent as in the very good product made of orange wood sold by johnson and johnson = but it just does not come up to scratch, as these bad review below. Bad Reviews on Amazon for Stimudent copy Made in China by Revive Personal Products http://www.bleedinggums.com/stim-u-dent/ 6 Reasons Why Dentists Recommend It! Designed in the shape of an isosceles triangle, Stim-U-Dent Plaque Removers fit perfectly between your teeth. By placing the base of the triangle against the gum tissue, you can remove plaque from the inner tooth surfaces and massage the gum tissue all in one motion. The tapered point fits so perfectly between your teeth, no matter how tall or short that space is. Perfect for dislodging food particles and plaque – keeping you clean and comfortable. 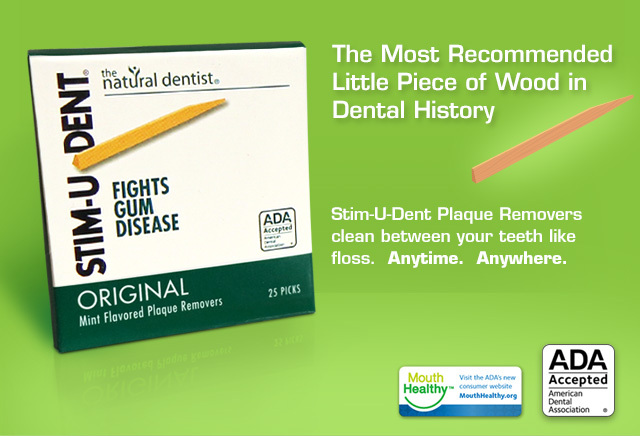 Made of special wood that creates the ideal texture and flexibility when wet, Stim-U-Dent Plaque Removers squeeze in between teeth and remove sticky plaque before it becomes tartar (the stuff your dental hygienist has to scrape off during your cleanings). And the wood is biodegradable and comes from managed forests. 4. They stimulate your gums. 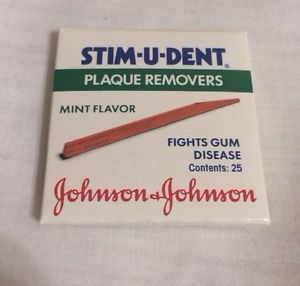 Stim-U-Dent Plaque Removers will remove plaque and food from between your teeth, but that’s only the beginning. The in-and-out motion used also stimulates blood flow to your gum tissue – keeping your gums nourished and healthy. 6. You’ll actually use them! 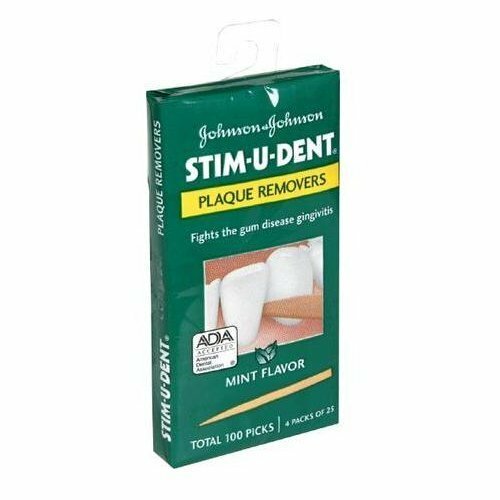 Stim-U-Dent Plaque Removers unchain you from your bathroom sink – remove plaque after every meal, on the phone, watching TV, in the car, after you go to bed. Seriously. Anywhere, anytime. Most people are familiar with carbamide peroxide since it is the agent most commonly used for bleaching (whitening) the teeth. The dental profession has recently begun to recommend carbamide peroxide as a means of preventing periodontal disease and tooth decay in patients who are unable to carry out normal oral hygiene measures such as regular brushing and flossing. For patients like these, rubber trays are fabricated to fit over both the teeth and the gingiva. The tooth indents in the trays are filled with 10% carbamide peroxide and the patient wears the trays for two hours once a day, or overnight. The carbamide peroxide breaks down into 3.5% hydrogen peroxide and 6.5% urea when it contacts plaque. The urea further breaks down into ammonia and carbon dioxide under the action of bacteria. The hydrogen peroxide kills the plaque bacteria, and the ammonia raises the PH of the plaque neutralizing the acid that causes tooth decay. The triangular shape of our dental sticks is designed to fit neatly into interdental spaces, and protect your gums and dental enamel from being damaged during the cleaning process. 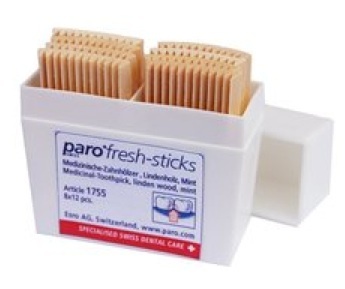 Our dental sticks are made of birch wood which works as a natural disinfectant, its texture and gently abrasive surface removes plaque efficiently and effectively. Available with a single or double end, and flavour can be added if required. Packaging options include plastic sleeves, carton displays, pocket packs and table containers. Lots of factors contribute to stained, yellow teeth. Drinking beverages that contain tannins, like coffee, tea and red wine contribute to yellow stains. Chewing and smoking tobacco can also stain our teeth. So, how can we whiten our smiles without paying large amounts for professional teeth bleaching or expensive over the counter teeth whiteners or damaging our dear mother earth? The trick I use at home, is simple, quick and inexpensive. Does this sound too good too be true? The recipe? Baking soda and hydrogen peroxide. That’s it. Pour some hydrogen peroxide into its cap and add a big pinch of baking soda. Brush with this “paste” for a few minutes, a couple of times a week. After achieving the whiteness desired, move to a once a week maintenance routine. How does it work? Baking soda, or sodium bicarbonate, is a slightly alkaline powder that when dissolved in water, releases free radicals. The free radicals from the mixture interact with the stain molecules on the teeth enamel (outer layer of the teeth) and scrape off the yellow and brown stains. It also removes plaque from the teeth. Baking soda is one of the cheapest commercial teeth whiteners present in the market today. One box of baking soda costs very little, and this one box can be used for over a hundred brushings. Baking soda has actually been recommended by some dentists to help fight gum disease. Hydrogen peroxide has a whitening effect because it can pass easily into the outermost layer of the tooth, and acts as an oxidizing agent in breaking up stain deposits. Bleaching teeth with a 3% hydrogen peroxide solution is acknowledged as a safe practice by ecodentists. Go easy. Use your common sense. Using baking soda in moderation. And do not deliberately swallow hydrogen peroxide. A little will certainly not hurt you. The views expressed in this article are only meant as suggestions. Pour 2 teaspoons (10 milliliters) of hydrogen peroxide into 3 teaspoons (15 milliliters) of baking soda. Mix these together until a paste forms. Play with these measurements until you find a consistency that you like. The paste should be similar in thickness to toothpaste. Add a tiny bit of mint toothpaste to your homemade paste to give it a fresh flavor. You can also add a drop of peppermint extract. Mix in a dash of salt. The salt will exfoliate your teeth as you brush. Dollop the paste mixture onto your toothbrush. Brush the paste onto your teeth in small, circular motions. Once all teeth are covered, let the mixture sit on your teeth for 2 minutes. Rinse the solution off of your teeth by swishing with water from the bathroom sink. Brush your teeth with toothpaste to rid your mouth of any remnants of the hydrogen peroxide mixture. Carbamide peroxide & Hydrogen Peroxide for teeth whitening. 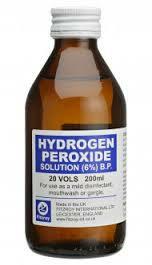 Hydrogen Peroxide does not harm teeth, in fact it keeps the mouth free of harmful bacteria. 100% Natural Full Strength Ingredients: Wildcrafted White Oak bark, Organic Plantain herb, Organic Peppermint leaf, Aloe vera resin, Wildcrafted Horsetail herb, Myrrh gum, Organic Clove bud, Organic Lobelia herb & seed, Goldenseal root. Organic Plantain – tightens tissues and is soothing. Conditions: Gingivitis, pyorrhea, and other tooth and gum problems. Might assist in tightening loose teeth. Excellent for normal brushing. This can replace toothpastes. *Please consult with your dentist or doctor if you have significant health problems or significant gum disease before using this product. Directions: Apply generously to moistened tooth brush and brush teeth as usual. The experience of using: You will feel a strong minty/ menthol taste as the herbs clean, heal, give nutrients to and disinfect your mouth. If you are highly sensitive to tastes and smells, this product may be too strong for you. This herbal combination will disinfect, reduce inflammation and tighten up the teeth and gum. Works well with Herbal Mouth wash two-three times per day. Tooth powders contain herbs which apply nutrients and natural medicines to your teeth and gums. Our tooth powder is very mildly abrasive and is in general less abrasive than tooth pastes and less abrasive than baking soda or other tooth powders made with low cost filler ingredients. The herbs in this herbal tooth powder are potent. Tooth paste is usually toxic with cheap fillers and ingredients. Many ingredients might be unlisted or mislabeled as cosmetic products do not require the same standards of food. Tooth pastes usually contain abrasive ingredients to make teeth look white and to polish off the plaque. Unfortunately it is difficult to perceive how abrasive the sand in them is because it is blended as a paste. Apply small amount to moistened toothbrush. Brush as usual. For a great smile, brush with Extra-Brite two (2) times daily for two to three (2-3) weeks. Then maintain your new smile with Eco-DenT DailyCare. Not recommended for children under twelve (12). … Some individuals may be sensitive to ExtraBrite’s powerful oxidizing whitener. If gums become sensitive, decrease or discontinue use. It has been reported that nylon 4 was degraded in the soil  and in the activated sludge . The results confirmed that Nylon 4 is readily degradable in the environment. Furthermore, the biodegradability of nylon 4 and nylon 6 blends was investigated in compost and activated sludge. The nylon 4 in the blend was completely degraded in 4 months while nylon 6 was not degraded . Recently, Yamano et al. was able to isolate polyamide 4 degrading microorganisms (ND-10 and ND-11) from activated sludge. The strains were identified as Pseudomonas sp. The supernatant from the culture broth of strain ND-11 degraded completely the emulsified nylon 4 in 24 h and produced γ-aminobutyric acid (GABA) as degradation product .